So it actually turned out to be a very, very tricky game, as the Red Bulls lost 3-2 against Chivas USA. The Red Bulls looked nothing like the dominant juggernaut they've been in recent weeks. In fact, for the first twenty minutes (or so) of this one, "The Goats" had the Red Bulls pinned in their own end. A weak team, on paper, LA's second team looked like FC Barcelona against us this past Sunday. This was a bizarre game, from beginning to end. A power outage delayed the start of this one, for over half an hour. 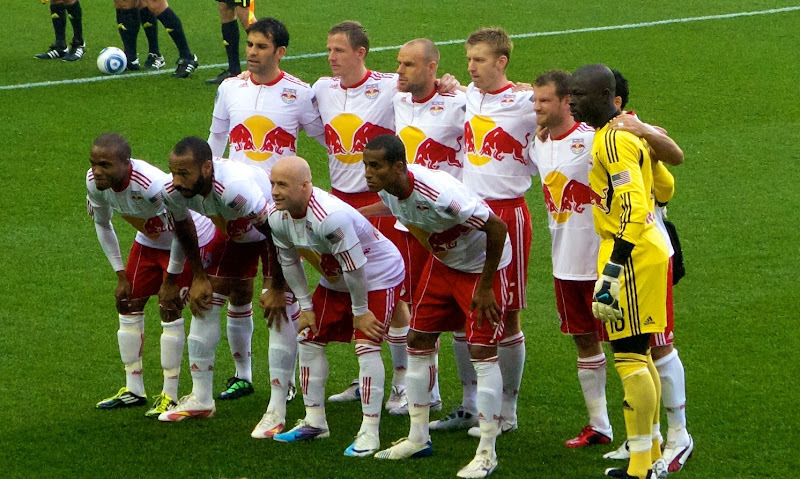 When the game did start, the Red Bulls looked nothing like the team that took it to the LA Galaxy the prior weekend. No, it was Chivas USA pressing for the opener and it came rather quickly. I had just turned to my TVN associate, Matt Conroy (aka Who Shot Sam), and mentioned that Justin Braun was the only "Goats" player that scared me, when (sure enough) just 6 minutes into the game, the big man stuck in his first of the evening. Fifteen minutes later, RBNY would get on the board through Thierry Henry's 5th goal of the year. Ten minutes later, however, Chivas USA would take the lead again through Braun's second of the night. While Braun's first was certainly a Golazo (or Goat-lazo), his second might rank among the worst ever given up by RBNY. Just "shocking", as Shep Messing put it, and you really have to see it to believe it. I mean, really, WTF was that??? I tell you what it wasn't: Bouna Time. Even after that one, however, it would only take the Red Bulls 4 minutes to even things up. Luke Rodgers was pushed in the box and Dwayne DeRosario converted the ensuing penalty. All things even at halftime, and it was a shoot-out @The Cathedral of Football. Parity would be short lived, however, as Chivas USA went ahead for good in the 56th minute. A Simon Elliot free kick from outside the RBNY box found not one, not two, but three "Goats" players totally unmarked. It only took one of them, Alejandro Moreno, to head it towards the goal. It looked like Bouna Coundoul got his fingertips on the ball, but it came off the post and Justin Braun (totally unmarked as well) was right there to tap it in and complete his hat-trick. Another WTF moment in this bizarre game that should best be forgotten quickly. Mr. Backe promises a tactical refresher course during this week's training sessions. We can only hope that pays off next weekend @Houston. Lackluster attendance for this one but a great atmosphere, nonetheless. Please click on the above video for Part I of usual drunken comments and predictions. Please click here for Part II and click here for Part II. You can click here for my photo album or click here for the slide show. Viper Out!